A sheet of protective perspex has been installed over an artwork which is believed to be the work of street artist Banksy. Camden councillor Adam Harrison is a fan of Banksy and had started a petition to get the work protected. Photo: Angela Lovely. A sheet of protective perspex has been installed over an artwork which is believed to be the work of street artist Banksy. The painting is on a wall on Westminster City Council’s property in Clipstone Street. The Council had said they would have the art removed because they have a policy of removing grafitti and see Banksy’s work as no different. However, it remains unknown who drilled 18 holes into the wall, fitted plugs then screwed a sheet of perspex to it before finishing the edges with sealant. 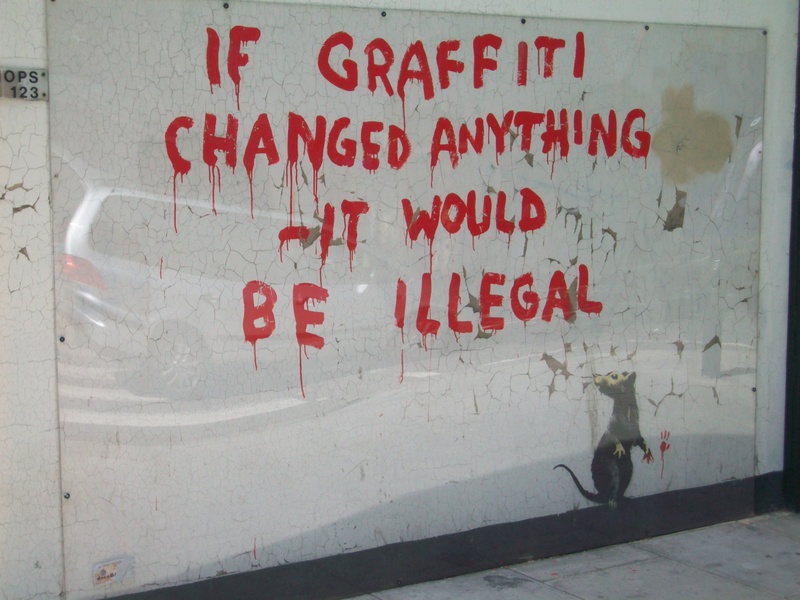 Camden councillor Adam Harrison is a fan of Banksy and had started a petition to get the work protected after a number of people feared that Westminster Council would have it removed. The artwork which appeared over a bank holiday weekend in April is on a wall on the corner of Clipstone Street and Cleveland Street at the end of a row of shops and next to the BT Tower. This is the second large work by Banksy to have appeared in Fitzrovia and in the part of the neighbourhood under the authority of Westminster City Council. A previous artwork — One Nation Under CCTV — was removed at the insistence of the Council after it decided it that it shouldn’t have been created without planning permission. From Thursday Andipa Gallery in Knightsbridge is displaying Banksy|War Boutique, an exhibition of iconic and sought after paintings by Banksy. Original works on display will include Banksy’s Laugh Now, a unique painting depicting one of the artist’s emblematic monkeys, scaled-up to human size, set upon the panels of a wooden door. Girl with Balloon, one of Banksy’s most iconic images, which infamously appeared on the Palestinian side of the West Bank Barrier, and Custardized Oil, a work of satirical humour distorting traditional aristocratic imagery. See Andipa Gallery website for more details. How long before someone decides that the perspex offers a perfect surface on which to execute a new “art” work? Or rather: A sheet of protective perspex has been installed over an asinine graffito which is believed to be the work of some arbitrary yobbo. Isn’t Perspex a tradename for acrylic that requires a capital letter? It is a tradename but it is spelt without a capital according to my Oxford Pocket Dictionary. But you made me check! Linus – assistant editor. One Nation Under CCTV was amazing and I thought it was sheer vandalism to remove it. This one is really only a work of art because Banksy did it, and you can associate it with all his previous work. Without those associations it’s quite witty but not really art, just an ephemeral message. It will be interesting to see what Camden decide to do. Well, it will be Westminster not Camden who decide as it’s on their patch. I checked your blog out. You have some nice pics there. Good one of the Tower in the header image. Linus – assistant ed.